16 10/100/1000 ports. Powerful, non-blocking backplane. Affordable enough for desktop connections. NETGEAR's JGS500 Gigabit Switch Series gives your office network a megaboost of speed and capacity that is within your budget. 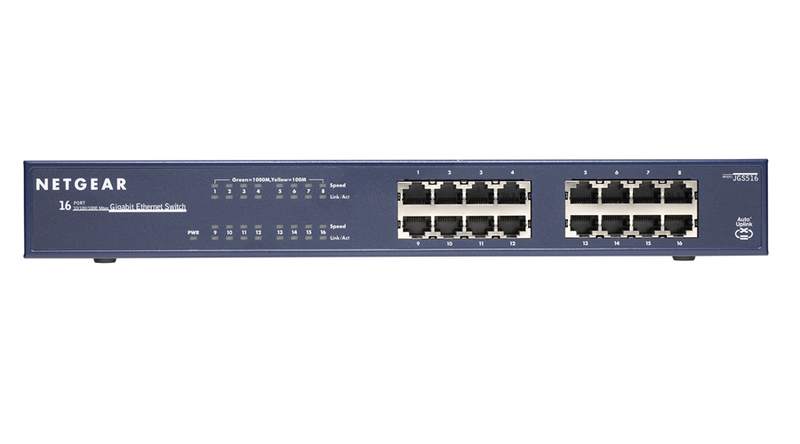 With up to 48 Gbps of bandwidth, these 16- and 24-port switches can blast 2000 Mbps per port while their affordable prices enable you to put them everywhere. Use it to take Gigabit Ethernet directly to the desktop! Standards-based for easy integration of 10-, 100-, and 1000-Mbps devices, these unmanaged, rack-mountable switches feature 10/100/1000 automatic speed and full/half-duplex sensing plus Auto Uplink™ on every port. Users can take advantage of the their ability to deliver large amounts of multimedia, image, and video information in no time at all. Ideal for workgroups, labs, departments, or growing offices looking for oustanding performance at a low price.